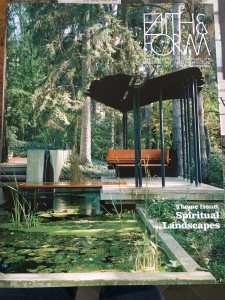 Virginia Burt FCSLA, FASLA, of Virginia Burt Designs recently had a feature article published in Faith and Form magazine. The article, Healing Gardens as Transformative Spaces (Volume 49, Issue 1), highlights the many healing attributes of healing gardens and spotlights The Schneider Healing Garden at Seidman Cancer Center (SCC) in Cleveland, Ohio. “Often I am asked, “What makes a healing garden healing?” The answer is: any garden is healing and research proves it to be so. It has been my experience, however, that deep transformative experiences can be facilitated in gardens designed specifically for healthcare settings. Healing gardens and exterior natural spaces within healthcare settings create liminal spaces that facilitate transformation in individuals, small groups, and communities.” from Healing Gardens as Transformative Spaces [Article Excerpt] by Virginia Burt FCSLA, FASLA. Faith & Form exists to provide and exchange knowledge, insight, and creativity among those who create and use religious art and architecture.